gitaneusa.com :: View topic - Gitane unannounced vtt bikes!! gitaneusa.com Forum Index » Modern Gitane » Gitane unannounced vtt bikes!! Cool gitane ad in arabic. I don't follow the new mtb that gitane makes. I want a gitane mtb, but I want a 83-84 mtb. come on! it's not Arabic. It's persian. I own this bike and am really pleased. It's awsome. What do you mean by 83-84 mtb? 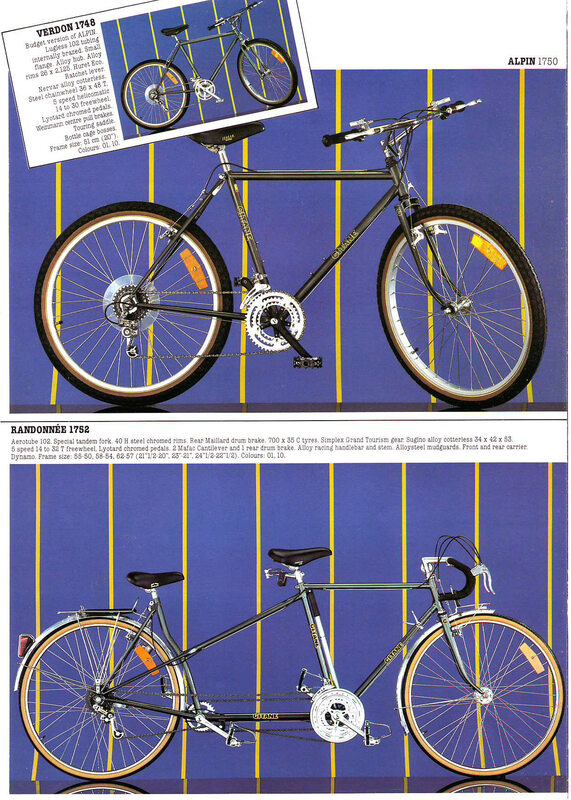 OK its Persian then, I'm looking to buy a 1983-1984 gitane mountain bike. Preferably in blue. is it possible?! Gitane was not producing mtb bikes in that era! What do you mean by that? Most of us, at least in the US, aren't very up on current Gitanes because they aren't readily available here. Your link doesn't work for me, but I took a look at the Gitane.com home page. Mountain bikes are probably a good choice for riding in varied terrain, except I don't like the knobby tires, which I think are mostly used to look like a cool motorcycle that has lots of torque and needs the knobby tires to dig into mud. When I ride in sand even on skinny 700x23 tires with a smooth tread I sink down a little, but I don't spin my wheels. If you don't stick to smooth roads a wider tire like a MTB or the old 27x1 1/4 I like make sense. A smooth MTB tire has a lot less rolling resistance than a knobby. I also think the narrow straight bars are not ergonomic. They will make sense if you ride narrow trails since they won't hang up on things, but like the knobby tires I think they are now for style rather than function. I'd prefer wider dropped bars or north road bars. what's your idea about it? seems to me you should do some browsing in the owners gallery, you may note that the vast majority of the users of this forum are roadies. (people who ride road bikes) I have nothing against mountain bikes, I own several. I just think you're kinda barkin up the wrong tree here. We are man, we just dont get alot of mtb folks on here. Only a handful of folks have gitane mtb's on the forums. Or bmx for that matter. Gitane was into bmx big time . I myself couldnt tell ya about anything about a new mtb . Can hardly tell u bout a vintage one. Like a poster said before, most here are road rider and mostly classic and vintage bikes. As noted we cant get gitanes in the us anymore. Not even road bikes without Importing them. But there are tons of 70's ,80's stuff around and thats what we tend to focus on. Not trying to be a homer but thats what it is. And ive suggested a mtb section. Maybe ther are people who do come here for mtb's, they just arent many peeps asking . If you get the bike, post what you think of it and you can be the start of modern Gitane MTB info! I've got it sir. I do believe that it's spectacular!